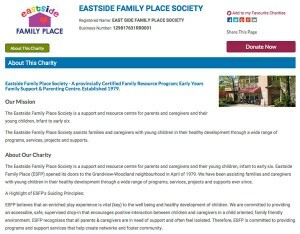 Donating to the Eastside Family Place Society is fast and easy thanks to CanadaHelps.org. When you donate, you can be confident that your personal information is secure, that Eastside Family Place will receive your donation, and that you will receive a tax receipt. Please make a donation today by visiting our donor page on CanadaHelps.org. Your donation will benefit many young children and families in our community. Thank you!